Along with his great predecessor, Luca Giordano, Solimena is the best-known painter of the Neapolitan Baroque.The easiest painting by Solimena to find in Naples is in the Church of Gesù Nuovo (located in the square of the same name), but you might actually miss it if you go into the church for the reason that you should go into a church. That is to say, you have to go in and turn your back on the faithful and look directly above the entrance to see the massive and spectacular The Expulsion of Heliodorus from the Temple. Even a graphic dunce such as myself (anti-references available upon request!) notices Solimena's signature characteristics—light and color, from the white charger in the middle to the splashes of the bright blue robes. I don't know why artsy types of the day didn't like it; perhaps it was too "busy" (it is indeed jammed) or perhaps not sombre enough. Indeed, descriptions of Solimena's works abound in vocabulary such as "golden light," "lovely harmonies of colour," "brilliant luminosity," "vibrant, atmospheric light," etc. Other of his works in Naples include The Massacre of the Giustiniani at Chios, in the Capodimonte museum; The Trinity, the Madonna and St Dominic, in the sacristy of San Domenico Maggiore; and various frescoes in the churches of San Paolo Maggiore and San Domenico Maggiore. 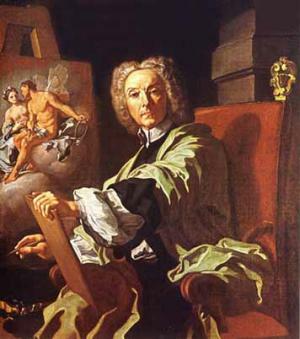 His self-portrait (here shown) is in the Museum of San Martino. He is responsible, as well, for the frescoes on the ceiling of the royal bedroom in the Royal Palace, put there to celebrate the marriage of Charles III (the first Bourbon king of the then newly independent Kingdom) to Maria Amalia of Saxony in 1737. Solimena had a long and very successful career and was, at the height of his powers, one of the most sought-after painters in the Europe of his day.